At FRAMECAD, we’re passionate about our customers. When designing our software and equipment, we’re consistently taking into account client feedback and needs, and creating products that suit our current and future clients. This dedication is also apparent in how we train and support our customers to make the most of their businesses through best practice cold formed steel construction. So what can you expect from your customer care journey with FRAMECAD? Customer care starts as soon as you become part of the FRAMECAD community. With all our manufacturing equipment made to order, we’ll inform you when your equipment’s in production, when it’s been finished and tested, and when you need to start preparing for its arrival. We’ll allocate a technician to you and confirm when you’re ready for commissioning. Before we even arrive onsite, you’ll receive your pre-commissioning manual – this covers your equipment, what everything should look like, how you get it into place and get power to it. We also give details on how to assess whether your space will work, and the things you’ll need for commissioning, from oil to the right kind of steel. Once we’re on site, the commissioning can begin. “If you’re new to the FRAMECAD System, this will start with a software expert visiting to give you software training, ensure you know how to design, and confirm what equipment you’re getting and how to configure your designs for your production,” explains Steve Wilson, FRAMECAD’s Aftersales Operations Manager. Still need more help? We have technicians available to train your team for a whole week or two. One of our technicians recently spent a month in Colombia, helping our client through the entire process of building their first 200m2 house from light gauge steel – from design right through to erection. Regardless of how long we stay, this process ensures that our clients are armed not only with how to use the FRAMECAD System but also the knowledge of operating a best practice cold formed steel construction business – experience gleaned from working with hundreds of companies and years of practice! Keeping your FRAMECAD System performing at its peak is a matter of ensuring it’s properly serviced every year or every 160km/100miles of steel rolled. You’ll receive automatic reminders, alongside preparation information for the service. This includes; confirming you have the right parts, oil, and rags available and making sure you know how much downtime to prepare for. One of our technicians will come on site, test all the functions of the equipment, look for any signs of wear and tear on parts that may need to be replaced, and get your equipment back in shape for another year of use. With clients all over the world, and many organisations running two shifts a day, it’s vital that support is available around the clock. Should a problem arise, or if you have any questions, you’ll be able to lodge a ticket in MyFRAMECAD and – in most cases – you’ll hear back from one of our team within an hour. That’s due to having support teams in New Zealand, South Africa, Dubai, and beyond, ensuring there’s always someone working no matter what time zone you’re in. After sales support varies significantly depending on each client’s needs – whether it’s technical support for equipment or software advice, requirements for new parts, or just questions around best practice. At FRAMECAD, both software and manufacturing equipment are development and manufactured under one roof (literally – although we’ve got sales and support staff and technicians spread around the world, all our software and equipment are designed and built here in New Zealand). This end to end approach ensures that we can trouble shoot through all the components of your FRAMECAD system, understanding where the possible issue could lay. We’ve always got someone to help us solve issues quickly, with technicians able to pull on the knowledge of software developers, mechanical engineers, and the entire FRAMECAD team of specialists. FRAMECAD are pleased to announced a substantial enhancement to their FRAMECAD Care Support System, Available through the exclusive MyFRAMECAD Portal, our Customers Can now expect an ever faster and more efficient handling of their enquiries. 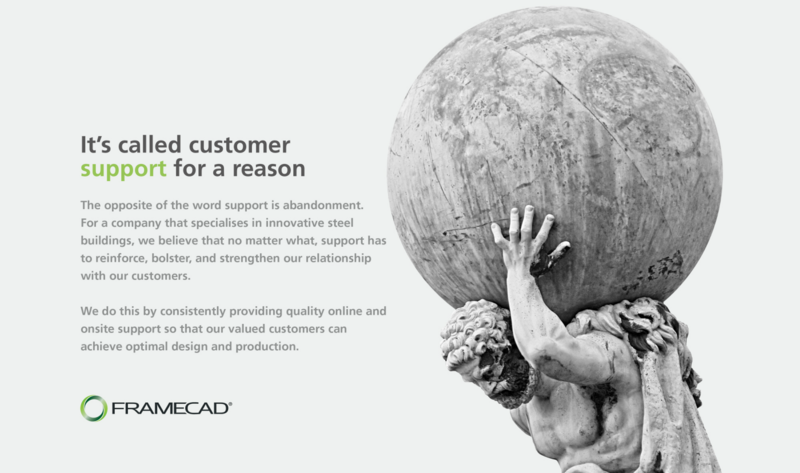 Talk to FRAMECAD today about how you can be a part of the world’s only complete end -to-end system for cold formed steel construction.